28th June 2012: Should You Publish With Your PhD Supervisors? I recently started working with a copy-editing colleague and a group of Victoria University higher degree students. I also advise business and law academics on their research programs. Both activities provide a reflection cycle on my PhD studies in political science at Monash University (my November 2010 PhD proposal). These experiences highlight some different approaches and research cultures at both universities. Publishing with your PhD supervisor is an opportunity that should be explored carefully. It is the norm in some scientific laboratory work and was also the case in a Cooperative Research Centre team I was on where the professor was the lead author. In that case, the professor had contacts with industry partners and government policymakers; had deep historical knowledge of the academic field; was able to arrange media coverage and a launch; could secure research funding and budgets; and could make judgments about the analytical research product. Some of the more novel, multidisciplinary and risk-seeking ideas were never published or written up formally from presentations. A professor or PhD supervisor who is the lead author will usually call the shots. A good PhD supervisor will help you publish in certain ways. They will provide developmental editing feedback on your draft. They will inform you about the appropriate journals to publish in; the editorial board and peer review standards; specific methods and research design issues; who the international and national experts are; and what current debates you can tap. They can explain obscure but important research administration like Higher Education Research Data Collection (HERDC) forms and Field of Research (FoR) codes. In doing so the PhD supervisor helps to socialise you into a research community and discipline. A PhD supervisor may also be unable to do this for several reasons. You may be one of their first PhD students and they are growing into the PhD supervisor role. They may be unfamiliar with your research questions. They may have been socialised into a different sub-discipline or sub-field. They may have gaps in their publication track record or may have changed topics. They may have signed up too many PhD students for workload points. They may have accepted a range of PhD students who are not in their specific area of research expertise and are spread too thinly. Or, they may not have kept up with these research and scholarly issues, and may be in a mid-career or late-career drift. You will sense this early on in PhD supervision meetings — and in good cases the PhD student provides renewal for the PhD supervisor. In bad cases you might change your PhD supervisor, and your university research office can advise you on how to do this. So, preferably, do your ‘due diligence’ on your PhD supervisors before you begin to discuss publishing with them. Avoid if possible a situation where you do the work and the PhD supervisor insists on first name on the published article in order to ‘game’ the workload points system. Don’t publish in an obscure journal that no-one will read or that has a ‘pay to publish’ fee. Use social media like academic blogs in an appropriate manner to make your research more visible to others (and don’t let this detract from your research writing). My personal preference is to either publish as sole author or in a team where the roles and name order are clearly negotiated upfront. My Monash PhD supervisors’ preference is for me to publish during my PhD and to publish alone in order to build my expertise and reputation in the field. They already have established their reputations and publishing track record, and have made specific contributions that also differ from my PhD research topic. I have already published in A-level journals without a PhD and been internationally cited. To achieve this you need exciting research questions; good research design; and to write to the standards of the ‘target’ journal or conference. Victoria University’s research culture is different and is more weighted toward PhD candidates co-publishing with their PhD supervisors. I hope this advice helps and good luck with your PhD research. Traditional lectures look set to go by the wayside at Deakin University. As part of a new strategy students will increasingly access online, open source content from around the world, freeing up academics to focus on smaller tutorial groups delivered not just face-to-face but increasingly through social media like Facebook. We can make several inferences from Deakin’s decision. GE and private equity-like models are influencing managerial decisions to cut high costs (including possible offshoring). The espoused rationale is to cut content development costs and prioritise customer-facing activities (with an eye to student experience survey results). ‘Lagging’ universities are responding in a game-theoretic way to what ‘leading’ institutions are doing (in what may be a form of Stackelberg competition). These strategies will place Darwinian selection pressures on academic lecturers who will become either ‘world class’ subject matter experts/researchers or content facilitators. This is the wider context for the challenge of “how can scientific and technological breakthroughs be accelerated to improve the human condition?“. In some ways, progress in Australia is being made in the required transformation of innovation; but in other ways the challenge is not being met. This article provides an outline of Australian trends and related recent developments. McGrail covers many topics including European Union developments; the National Enabling Technologies Strategy; biotechnology and synthetic biology; and insights from science and technology studies. Some of this work draws on insights from McGrail’s excellent Masters thesis at University of Melbourne on Australia’s nanotechnology industry. Mary-Helen Ward tweeted this morning about academic redundancies at Australian National University, La Trobe University and the University of Sydney. Ward points out that ‘academic freedom’ is often equated with a ‘job for life’ ethos that other industries do not have. “Redundancies are always about money. Managers have to manage with what they’re given. Where is academic freedom?” she asks, responding to a tweet from Thesis Whisperer, Dr. Inger Mewburn. An older cohort of academics cite academic freedom as an essential part of their university’s social contract. For them, academic freedom is comparable to political ‘freedom of speech’ and to safely critiquing institutional politics and power. Academic tenure — or a ‘job for life’ — has been the institutional mechanism through which academic freedoms are purportedly secured and protected. ANU’s Rohan Pitchford has argued strongly that the University of Sydney’s academic redundancies will undermine institutional tenure and thus academic freedoms. 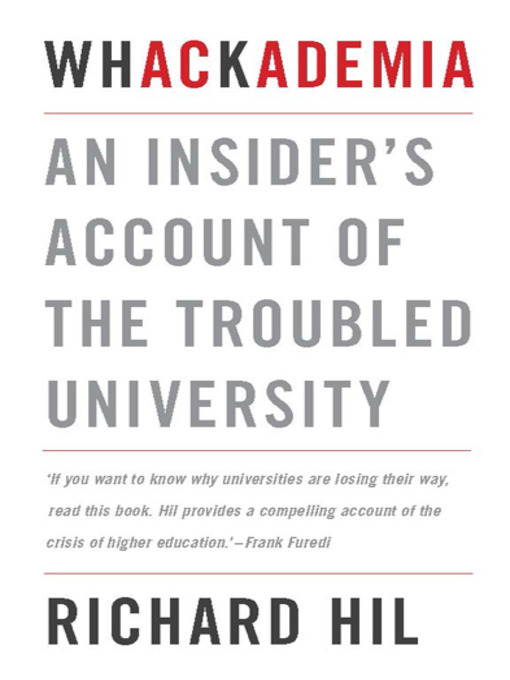 Richard Hil and his complainant interviewees also express this view in the new book Whackademia, as does critical press coverage that focuses on the interaction of Federal Government policies, university senior management, and job markets. Younger academics and administrators may have a different view on the link between institutional tenure and academic freedoms. Many in this cohort are in casual or administrative roles that do not have the same benefits that full-time academics receive. They have possibly gone through career changes and may not have the same expectation of a ‘job for life’ (or even for the next five years). They have found their freedoms in forums that are outside universities or that are marginalised in academia. They see professors with managerial skills who are promoted into management and other professors who don’t engage with the university community at all. They see Orwellian ‘freedoms’ like the ‘publish or perish’ norm that you assign your intellectual property to a profit-making international publishing conglomerate — or you don’t get promoted. They are in a ‘winner-takes-all’ workplace in which a small group either meet productivity benchmarks in the workload model or ‘game’ the system. And usually the people who benefit from this are the more established academics and elites. This is why mentorship in universities for younger academics is so important. Yet it varies depending on how important it is to the senior academic or professor. The difference between the professoriate and younger academics can be likened to the shift from defined benefit pension plans to defined contribution pension plans in superannuation and private wealth management. 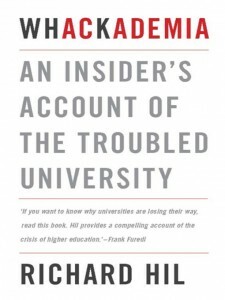 Making institutional tenure the underpinning of academic freedom means assuming that universities will maintain your academic, high-paying role forever. As Ward points out, that doesn’t happen in other industries (Margin Call anyone?) and certainly not in a time of changes to government funding, sectoral hyper-competition, and economic uncertainty. It also allows some mid-career and senior academics to drift and to ‘game’ the system whilst their younger colleagues face tougher productivity demands. There is plenty to question and debate in the recent redundancy decisions at several universities. The University of Sydney raised issues about decision rules, due process, fairness, transparency, and budget scrutiny. Other questions: What criteria underpinned the financial forecasts? What risk management systems were in place to meet specific financial targets, and why did they fail? Can the financial forecast estimates be revised? Are the performance goals in university strategic plans really feasible or are they just ‘strategy through inflation’? (Richard Rumelt raises this flaw about strategic planning in his book Good Strategy, Bad Strategy). Will the strategic plans survive their Clausewitzean contact with competitive ‘friction’? (No, Clausewitz argues they never do, no matter how well-meaning the strategic planners are – Henry Mintzberg‘s influential book The Rise and Fall of Strategic Planning also deals with this.) Is the strategic plan really unique or are our competitors thinking about the same positioning and value creation? Are we making budget and planning decisions that are really due to ‘institutional capture’ or outdated ‘images of the future’? Is senior management just reacting to short-term fluctuations in student numbers that will detrimentally affect our university expertise? What is the appropriate use and also the potential institutional misuse of research bibliometrics? What psychological support and employment outplacement services are being provided to those who accept or are forced to take redundancies? What are the ‘undiscussables’? What are the possible, preferable and potential futures that we are not exploring? (Maree Conway and Rowena Morrow have insights.) What will be the second- and third-order effects of our decisions, and over time? You can probably think of many other angles and questions that could be raised, debated and constructively explored. Maybe there’s a vigorous debate in a professoriate forum that I’m not privy to. But I don’t see it in the public forums I have attended. For a contrast to universities consider money manager Ray Dalio. He runs Bridgewater Associates which is the world’s biggest hedge fund (as defined by assets under management). Dalio is famous for his Principles (PDF) which outlines his personal management and investment philosophy. Dalio has given recent interviews to The Economist and Barron’s. He has given in-depth interviews in recent books by Maneet Ahuja (The Alpha Masters) and Jack D. Schwager (Hedge Fund Market Wizards) about Bridewater’s work culture. In Bridgewater, every management meeting is taped and made available to employees, who are incentivised to provide critical performance feedback to managers and directly, face-to-face to each-other. This is designed to thwart cognitive biases and decision heuristics that are critical to investment decision-making — I recommend Daniel Kahneman‘s book Thinking, Fast and Slow as a good primer. The debate is often around the computerised decision rules and mental models that Bridgewater uses to make over 100 investments in 15 uncorrelated revenue streams. Dalio’s employees don’t necessarily have the freedom to publicly debate Bridgewater’s investment decisions — but they appear to have more freedom within the organisation to help shape daily decision-making and culture. Universities — senior management, professioriate, and younger academics — all clearly have a lot of catching up to do. Firstly, think of it as reading, rather than writing. Lehrer is a wide-ranging polymath: he is sent, and stumbles across, all manner of interesting things every day. Right now, I suspect, he files those things away somewhere and wonders whether one day he might be able to use them for another Big Idea piece. Make the blog the place where you file them away. Those posts can be much shorter than the things Lehrer’s writing right now: basically, just an excited “hey look at this”, with maybe a short description of why it’s interesting. It’s OK if the meat of what you’re blogging is elsewhere, rather than on your own blog. In fact, that’s kind of the whole point. Secondly, use links as shorthand. Kouwe and Lehrer were both brought down by the fact that they felt the need to re-write what had already been written elsewhere. On the web, you never need to do that. If you or someone else has already written something well, just link to that, rather than feeling the need to repeat it. Thirdly, use the blog to interact with your peers, rather than just primary sources. There are hundreds of great science and ideas blogs out there already; start reading them, and be generous about linking to them. Your readers will thank you. When you see an article you wish you’d written, link to it and say so. When someone finds a fantastic paper and writes it up in a slightly incomplete way, credit them with the great find, and then fill in the blanks. When two or three people are all talking about the same thing, sum up what the debate is, and explain where you stand. Fourthly, iterate. Lehrer is a big-name journalist at a major publication: when he writes stuff, people respond, often on their own blogs, and often with very keen intelligence. Link to those people, learn from them, converse with them via the medium of blog, and use that collaboration and conversation to hone and further develop your own ideas. Treat every blog post as the beginning of a process, rather than as the end of one. 1. Blog to capture initial ‘seed’ ideas. Some academics struggle to get ideas for journal articles. They may follow the route of turning old conference papers into articles or relying on old data-sets. In contrast, I have enough article ideas for the next five years. I looked over unreleased material from the past 10 years and found possible ideas for 80-100 potential articles in various fields: media, foresight, counterterrorism, and technology. In some cases, I have fragments and outlines of these potential articles. In other cases, my online work dwarfs the number of published articles I have. Blogging regularly provides a way to capture these initial ‘seed’ ideas and to see over time whether or not they are worthy enough to become articles or if they just remain fragments. It provides a way to test and play with ideas that can be discarded quickly. Try and ‘fail fast’. It allows further thought than the 140 characters of a Twitter tweet. I sometimes have to remind people that Sir Tim Berners-Lee envisioned the World Wide Web as a communications medium for researchers to share information and not just to share Facebook posts. Some academics have two counter-arguments that are relevant. First, blogging wastes valuable writing time and has little impact. Second, blogging usually involves half-formed or fragmentary ideas. I argue below that blogging helps academics to write more and can have specific impacts that are not yet measured by promotions committees but that are very real and observable. As a developmental editor the problem I encounter with academics is not the workloads model but rather their lack of a regular writing regimen, time management, and project management skills. I know this is the case because academics with these skills can still work within the constraints of the workloads model to achieve the outputs required by their Minimum Standards of Academic Levels criteria in their job contracts. I suggest that blogs are treated as part of the ideation process — and that the drafting and re-editing of doctoral dissertations and journal articles is treated as a separate, parallel process. Some academics still don’t take this view seriously. Their focus is on A* and A level journals and perhaps major book publishers. I respect that view and I know how much hard work goes into that material, and the high standards of research design that are required. Unfortunately, some university administrators use this focus as a performance goal without understanding the time and effort involved. I see a big gap between the rhetoric and the academics who can actually achieve these goals. For example, I have seen CVs with many publications that, on closer examination, turn out to be vanity book publishers and questionable international journals: a sucker’s game. I also disagree with the ‘scarcity’ view that underpins some academic publishing. I’m comfortable with showing the ‘messiness’ of research as it unfolds. Academics can still have a minimalist blog or social media presence to alert other researchers and the general public to their work. Many people do not have access to institutional journal subscriptions but might read and value an article version that is deposited in a university repository. 2. Blog to monitor a discipline or epistemic community. Tufts University political scientist Dan Drezner recently joked that political scientists were now more ‘relevant’ because they blogged. Zammit’s own site has an extensive blogroll and interesting articles such as one on jihadism datasets that I wouldn’t probably have known about had he not taken the time to write about them. I now scan Tadas Viskanta’s blog Abnormal Returns on a daily basis when assessing market conditions for my portfolio. I have learned from the Research Whisperer and Thesis Whisperer blogs. I have dialogued with friend and colleague Roy Christopher on writing, rewriting, and how academia can kill writing: an important discussion for professional self development. Spending an hour a week means that I’m across what these experts and communities are up to. Their blogs also capture different kinds of information than the searches I do on the Scopus and Web of Science databases, and in the relevant academic journals in my fields of research. 3. Blog to control your public expertise and also to raise the visibility of published articles. I’m a research administrator so my employer university hasn’t given me a public webpage on their site. Instead, I’ve cobbled together a web presence through this personal site; profiles on Twitter, Academia.edu, Google Scholar; and sites like The Conversation. I comment about research in-progress and post relevant news items. I try to turn each article’s publication into a personal ‘release’ event similar to music and film. Blogging has led to several productive collaborations, to higher article citations by international research teams, and to the opportunity to do blind peer review for several international journals. It enables me to comment on new developments not covered in an article. This is a ‘work around’ for the significant delays in journal publishing and also maintains the ‘currency’ of individual articles. 4. Keep your major projects separate. I try and blog several times a week or spend 10-15 minutes compiling a daily links list. (I did that for eight years at Disinformation — see the 1998-2003 site archives — so I can do so very quickly.) I also have several articles and a PhD draft that are in-progress. For me, the blog serves as a daily exercise to get writing and to capture relevant information that won’t necessarily be included in the articles or PhD. I found that drafting, re-drafting and understanding quality scholarship in a field is pivotal to the PhD, whilst understanding current debates and editorial formats is crucial to journal publishing. It’s OK to keep your major projects separate or ’embargoed’ if it helps you to complete this research. Just use blogging and social media as a tool to develop your writing prowess and to self-promote your expertise and research outputs. The Flaw of Averages (Reading The Markets). Blaming London for Bank Botches Is Too Convenient (Slate). When a stupid op-ed produces some smart debate (Foreign Policy). Microsoft Buys Yammer for $US1.2 billion (Microsoft). Paul Thomas Anderson’s New Scientology Film (The New Republic). Inside the Brains of Justin Bieber Fans (WSJ). Goldman Sachs ($GS) and Wall Street 101 (The Minimalist Trader). How to avoid becoming a myopic fund investor (MarketWatch). The new rivalry: Traders versus Macros (The Reformed Broker). US legislators trade in the stocks of companies that they can impact (Washington Post). Why women and foreign policy professionals can’t have it all (The Atlantic; Foreign Policy; The American Spectator). What if the Apple Store were the worst job around? (Slate). La Trobe University is cutting 45 academics from its arts and humanities programs. I was sorry to read that Dr. Geoff Mayer will be one of them. I took several of Mayer’s classes as a cinema studies undergraduate, notably in Pre-Code cinema, film noir and western genre films. These classes taught me how film form and genre conventions can change over time and how this may reflect changes in social values. Mayer’s classes informed a 1998 proposal on Spiral Dynamics and cinema studies (PDF), a 2002 presentation on Integral theory and film (PDF), a 2003 essay on film and epistemic frameworks in futures studies (PDF), and a 2003 seminar on Spiral Dynamics that used DVD film clips (PDF). Mayer brought senior leadership and research insights to La Trobe’s cinema studies program for over a decade, and his mentoring, warmth and humour will be missed.